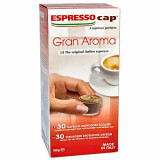 This is a strong coffee that expresses creamy, full-body, intensity with a hint of bitter chocolate, tobacco and dried fruit. 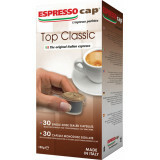 It is the ideal espresso for the strong and decisive coffee enthusiast made from a mixtu..
Top Classic is a rich blend of coffee to be enjoyed at any moment. 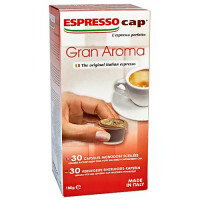 It is a medium strength espresso, still slightly sweet, with light acidity, a rich aroma and creamy taste. In its full flavour it has a suspicion o..
120 Capsules Caffè Top Classic Espresso Cap TermozetaTop Classic is a rich blend of coffee to be enjoyed at any moment. 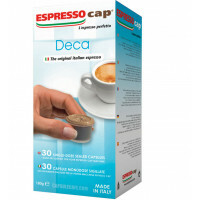 It is a medium strength espresso, still slightly sweet, with light acidity, a rich aroma and c..
An exceptional espresso that combines the reduced caffeine content (not exceeding 0.1%) with a rich and full-bodied taste of a great personality. 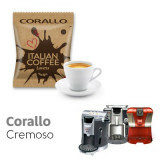 Its cream, hazel-colored, is particularly dense and persistent.Highlig.. 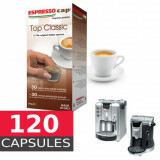 Capsules are compatible with Espresso CAP machines only!